Friendship is faith, trust, joy, fun, creating something together. Friendship is true, when it is not always based upon ego, it is true when it is open and others are allowed to become friends with your friend. It is true when it has some positive cause but it is hampered when it is developed for some selfish motive. It is true when friend is always available for you in all your challenges and in any odd times. But it is not true, when fake reasons are given to keep friendship going. Friendship based upon truth lasts longer. When two friends come together for a good cause they create something beautiful. 1. For this activity, you need one A4 size paper, two pencils, one table and two chairs or you also can sit down to perform this activity. 2. A paper will be kept between both of you and you both will start drawing on it. Both will be drawing on the same paper and on the same topic. 3. It has been observed that Initially people have torn at least one paper, asked for making two halves of the paper, not become easily ready to draw on the same topic. Showed less amount of trust. And that also loosen their confidence. 4. Let it happen in the beginning for some time; and then give them a minute to think for a while. And Start again. 5. Many of them find out way to complete the task. And take the challenge quite well. Some of them still have problems. May be the other friend is taking more paper, more space or something like this or the common complaint is, other person is spoiling the drawing. Just observe whatever is happening. Every reaction, there is a new scope for learning. A True friend is that who connects. Loving relationships are crucial to our well-being and happiness. Connections and relationships create space for safety and support that help us to explore and learn more. We can build more resources and cope up appropriately with stress and adversity. Self - worth is validated. Diverse ideas and influences help us to grow and become successful. Fun, care and celebration of good times. People with strong social connections have less stress-related health problems, lower risk of mental illness, and faster recovery from trauma. Healthy life-style habits are promoted. Psychologist James H. Fowler studied the data of 5,000 people over 20 years and found that happiness benefits other people through three degrees of connection, and that the effects last for a year. He says, " We found a statistical relationship not just between your happiness and your friends' happiness, but between your happiness and your friends' friends' happiness." The concept "hedonic adaption" is may be an exception here. Hedonic Adaption is that, joys of loves and trimphs and sorrows of losses and humiliation fade with time. In contrast to material goods, we are more likely to continue to want our close relationships, even after we attain them, and to continue to derive positive emotions from them. Zen Habits, by Leo Babauta, He mentions that, with connections we also meet with new opportunities, collaborations and emergence of new creation which was not before there. He also explains the importance being open for new people and thoughts. And coming real with other people rather than just a knowledgeable, smart, accomplished and funny person. That is also true but not completely true so, there is a danger that these things may hinder in the process of being a true friend and create true connections. Sometimes being vulnerable is not bad. That shows trust among all other new strange people. And that may also increase the possibility of trustworthy, deeper connections and long-lasting better friendships. So be a good friend, be real, be vulnerable, be connected. 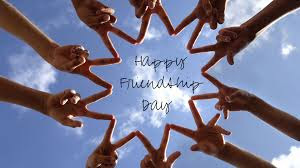 Have a great friendship day. Images ( first 2) : From MinEin : Mindfulness Emotional Intelligence Program.